Research and Development of Environemental Protection Company ECOPOL Limited Liability Company was founded and registered in the Commercial Register of the Local Court in Szczecin on 29th May 1989.
solution of various problems connected with water-waste economy in industrial plants and waterworks, together with legal regulations. Apart from the above mentioned, we began the production of Active Mass G-1 that is used in order to remove iron and manganese from so called "difficult" waters. 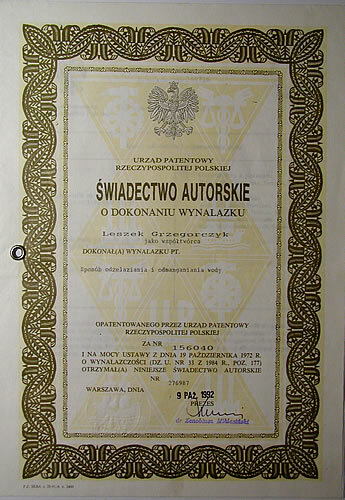 On 12th December 1989 our company was registered in the National Register of Innovative-Developing Enterprises. The implementation of new invention: "The method of removing iron and manganese from water" which was patented by the Patent Department became our priority [ look the Patent ]. It has been and still is a very modern method of removing the above mentioned elements from water, especially considering the latest requirements reffering to the quality of drinking water and maximum amount of iron and manganese in it. Growing expectations concerning the quality and the choice of our products forced us to develop and modernise our technology and the system of production. As a result we are able to offer a better quality product which transforms directly into the growing need for Active Mass G-1. At the moment we have just finished another modernisation which resulted in an installation of modern devices and machinery used for the production of Active Mass G-1 that will enable us to provide customers with a good quality product. Apart from this, we are constantly extending our offer in order to supply our customers with: sands and quartz gravels, decrepitated dolomite and also machinery and equipment necessary for the construction of water treatment installations. Moreover, we are able to deliver the above commodities to any place indicated by the customer.